VCU will live to play another day, earning their eighth trip to the NCAA tournament over the past nine years. They’ll tip it up with the American Athletic Conference’s fourth-place finisher, the Knights of Central Florida, a program making their first trip back to the tournament since the 2005 season. Both teams are coming off opening game conference tournament losses, VCU a Marcus Evans-less upset L at the hands of Rhode Island, UCF a blowout loss to the Tigers of Memphis University. Winner (barring a miracle) will take on the tourney’s No.1 overall seed, Duke Blue Devils. The headliner on this UCF team is no doubt 7’6 Senegalese big man, Tacko Fall. The senior center is the largest man in DI hoops and will most certainly get a ton of the attention going into this game — especially with a looming contest against fellow superhero, Zion Williamson, should the Knights advance past VCU. But Central Florida is so much more than that and Ram fans will get to know the experienced high-scoring duo of B.J. Taylor and Aubrey Dawkins as well, the team’s top scorers on a very experienced roster (the 20th most experienced team in the country, to be specific). Dawkins is a Michigan transfer and LETHAL three-point shooter who boasts a career mark of 41.3% from long distance. He’s been good for 15.2 points per game for Johnny Dawkins’ club, something even more impressive when you consider the Knights play one of the slowest tempos in college hoops. The 6’6 junior is joined by 6’2 senior combo guard, B.J. Taylor. The team’s leading scorer at 16 points per game, Taylor plays a fairly mistake-free brand of basketball and leads UCF with a +4.8 offensive box plus/minus. His 6.4 fouls draw per 40 minutes just out-paces Marcus Evans’ 4.3, giving UCF two players at over six per 40 (Fall being the other) on an offense that ranks second in the nation in free throw rate. Defensively the Knights rank 36th nationally in adjusted defensive efficiency and checked in at second in AAC play on that side of the ball. Fall’s 11.2% blocks percentage makes it extremely hard for teams to finish around the basket, checking UCF in at 14th nationally in two-point percentage D at 44.6%. Like VCU, they’re almost just as good at defending beyond the three-point stripe, but unlike VCU aren’t as apt to turnover their opponents. 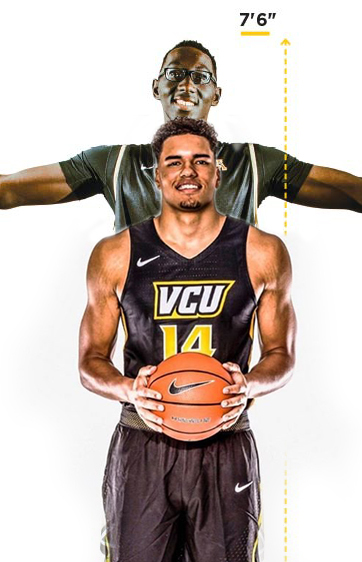 Collin Smith – Some VCU fans may remember Smith from his brief time at GW. The 6’11 center does a lot of the backup work for Fall, but apparently joins him on the court as well in a skyscraper stretch-4 role. Smith hasn’t been particularly great from deep during his brief career, but he will step beyond the line to keep teams honest. Smith has struggled with efficiency this season, but is certainly capable of a big night. Terrell Allen – Solid size as a 6’3 point guard, Allen is a capable three-point shooter, can heat the ball up on defense and is a solid distributor. The huge question for VCU heading into Friday’s matchup is Marcus Evans’ ability to play and be effective. With VCU up eight and looking to add two more at the stripe against Rhode Island in the Atlantic 10 quarterfinals, Evans was fouled in the act and saw his night come to an end due to a knee injury. VCU was outscored by 13 from that point on, surrendering 41 second half points to a Rhode Island team that averages just 67.8 points per game. The 75 points allowed were the most by this VCU team since December. Evans ranks second on the team in overall box plus/minus, but tops on the offensive side at +3.9, one of just five VCU players with a positive offensive box plus/minus on the season. His availability against a defense like UCF is everything this Friday. VCU did luck into a 9:40PM Friday night tip, Basically about the latest tip time Ram fans could’ve asked for (could’ve been an afternoon Thursday game), giving Evans additional time to heal up. Evans has shown an almost Wolverine-like ability to heal (dorky comic reference, look it up), coming off two achilles injuries, the second of which threatened to keep him out of a good chunk of this season, only to see him ready by opening night. UCF will be the Rams’ third game this season against a kenpom top-50 team (No.46). VCU split their other two contests, pushing UVA on the road before surrendering a second half lead to the top-seeded Wahoos, but won their other top-50 matchup, a road game against former head coach Shaka Smart and his Texas Longhorns. Like Central Florida, both opponents rank top-40 nationally in defensive efficiency. With Evans, this is a great matchup for college hoops fans, as one would expect in an 8 v 9 game. Without the Rams’ starting point guard, Central Florida likely claims the advantage, perhaps even a heavy advantage. Simply put, when Evans has struggled this season, so has VCU. The redshirt junior posted a 113.4 offensive rating in VCU’s 16-2 A-10 regular season championship run versus an average o-rating of 78 in VCU’s six regular season losses. Remove him from the lineup and the Rams have a tall task ahead of them. So it starts there. VCU absolutely needs Evans in the lineup. Assuming (/hoping/praying) that happens, I’m of the opinion the Rams will need one of their random good three-point nights to get it done, combined with a little old fashioned havoc. Shooters say they are either hot or due and VCU is clearly a team full of shooters. Despite connecting on 30.7% of their threes this year — ranking 330th nationally in the stat — 41.1% of the Rams’ shots come from behind the three-point line. That’s a pretty high number for any team, let alone one that ranks 330th on the year from distance. But despite that number, VCU has proven capable of getting hot. The Rams had has many 35% or better nights (top-100ish) as they did under 30% (sub 325ish) and shot over 40% from distance (top-5ish) five times in conference games. They are three-point Russian roulette and black and gold fans will hope there’s a bullet in the chamber on Friday night. Defensively a havoc-filled night would go a long way as well, as points in transition are also a lot easier to finish than points over Tacko. Central Florida averages 11.8 turnovers per game this season, but turned it over 14.1 times on average in their losses this season. That numbers rises to 16.5 in losses to top-100 turnover defenses, with the best of those turnover defenses to defeat UCF, Memphis, the 43rd best turnover D in the country, winning two of their three games against the Knights. VCU ranks ninth nationally in turnover defense. Kenpom: 63-62 VCU win with a 53% chance of a Rams victory.